Het artikel â€˜de aanwinstâ€™ is in Trouw gepubliceerd op zaterdag, 5 maart 2016. Amsterdam photographer/producer Reindert Groot and his spouse Fieke Pabst have been collecting objects made of Bakelite for over 25 years. It is one of the first plastics invented in 1907 by the Belgian-American chemist Leo Baekeland. Bakelite was especially popular during the thirties and forties. After the war more modern plastics appeared on the market. This collecting by Groot and Pabst has gotten quite out of hand. Their Amsterdam Bakelite Collection now holds four thousand objects, ranging from a simple electric plug to TV sets, cameras, vacuum cleaners, tables and chairs. They have all found a place in their home. The styles of Art Deco, Bauhaus and the American Streamline design are generously represented. Not just anonymous technicians, but also well-known industrial designers such as Henry Dreyfuss, Louis Kalff, Gio Ponti and Philippe Starck have designed the objects. 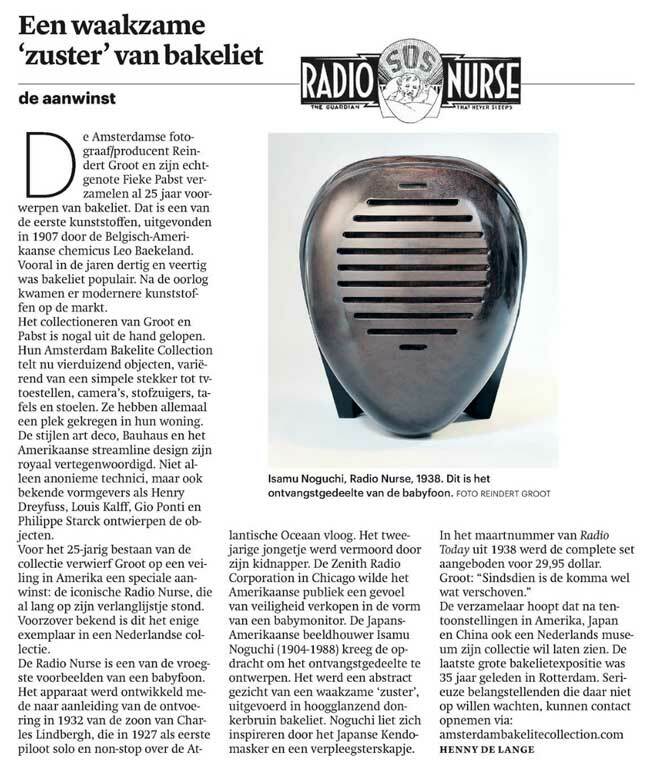 For the 25th anniversary of the collection, Groot obtained a special acquisition at an auction in America; the iconic Radio Nurse, that had been on his wish list for a long time. As far as known, this is the only one in a Dutch collection. The Radio Nurse is one of the earliest examples of a baby phone. The device was developed partly due to the kidnapping in 1932 of the son of Charles Lindbergh who, in 1927 as the first solo pilot flew non-stop across the Atlantic Ocean. The two year old boy was murdered by his kidnapper. The Zenith Radio Corporation in Chicago wanted to sell a sense of safety to the American public in the form of a baby monitor. The Japanese-American sculptor Isamu Noguchi (1904-1988) was commissioned to design the receiver part. It became an abstract face of a â€œnannyâ€� expressed in high gloss dark brown Bakelite. Noguchi was inspired by the Japanese Kendo mask and a nurseâ€™s cap. In the March edition of Radio Today of 1938, the complete set was offered for $29.95. Groot: â€œSince then the decimal place has moved somewhatâ€�. The collector hopes that after exhibits in America, Japan and China a Dutch museum will want to exhibit his collection as well. The last large Bakelite exhibit took place 35 years ago in Rotterdam. Please feel free to forwardÂ on to others. Bakelite Â is a registered trade name of Momentive Specialty Chemicals Inc.